An original store in Second Life that has a little bit of everything for customizing your avatar and for your roleplaying needs! This is my little store that I created for anime and videogame fans, role-players, and as a way to express my unique taste for fashion. My goal is to create a little bit of everything a Second Life role-player may need to invent his or her avatar and create a unique, beautiful character. I have made everything from actual anime cosplay costumes, like my famous Vampire Knight uniforms, to scripted neko ears and tails, and even a fully scripted furry avatar. There is almost no niche I won't break into and no role-play theme I will overlook. I also have a remarkable line of skins, shapes, hair, and eyes. They are nicely detailed and can help users who have a bit more trouble making their avatars look anatomically correct and aesthetically pleasing. Konnichiwa all! Thanks to the scripting marvel of Conflicting Destiny, .:.OtakuDzNs.:. now has a new hot item for sale! 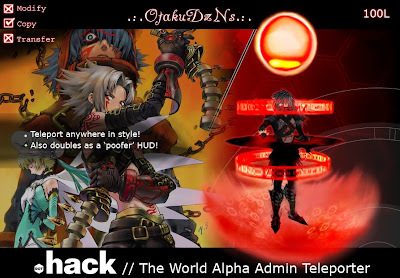 .hack// fans may rejoice! Black Friday 50% off everything!!! .:.OtakuDzNs.:. is now chopping the prices in half off everything in the store, but this sale will only last from midnight, November 27th, to 11:59PM. Come shop and make great savings! Buy holiday gifts for friends and family! Note: If buying a gift for someone else, please IM Ayame Fujita with the person's name so I can send them the desired item since all of my items are no trans. Thank you and happy holidays! Click HERE to TP to my main store! 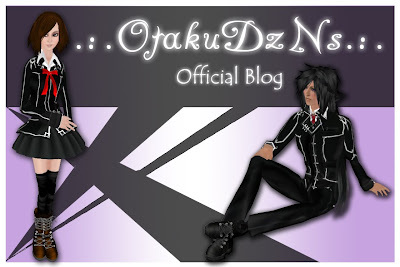 .......................................................I am the owner and creator of the .:.OtakuDzNs.:. franchise. It is my hope that someday my store will grow and be well-known throughout Second Life!